It’s a good thing we can now share the neighborhood with a tree. Thank you so much, brilliant, shades on! Thanks for your email that led me to your personal blog. Sorry for not responding earlier. Very good poems here. I have bookmarked your blog. My husband and I have been on a walking holiday in the snow for fourteen days. The landscape was breathtaking and I can honestly say I walked in peace for peace :). Beautiful Snowful Trees I´ve seen!! A nice surprise it was, Mieke, seeing you drop in. Thanks for the compliment! Stop by anytime. Thanks for the hearty welcome! …but… it is good to be on the road again. Hey there, you one guy! I was wondering how long it would be before someone wood listen to me. My children number zero, and my poetic skills wouldn’t match yours. So maybe I’m someone else you know, of course, I may not be at all. But I do listen sometimes. I wanted to stop by and add your blog to mine. This way people that read mine will stop here too. You are a great poet. I am going to be busy reading here for awhile. That was more than kind, Shia. Thank you very much! visiting your site today. The pleasure was mine! By the way I send you hughs mr.
and it explains why I play like a tree sometimes. Sometimes you find small bundles of joy scattered in the form of poems across the blogs such as yours. I am delighted to find it and will go through every page starting now. Thanks for bringing meaning and joy to my life. I am enriched. Nice to meet you, tikuli! Thank you very much! i love the way you are progressive in your prose; yet reminscent of style and depth of the poets i so admire from the past. you pull it off effortlessly without being anyone other than yourself. thank you for stopping by my blog and leaving your comments! And you are welcome to take the detour anytime. I’ll have to cruise back over to you when I get the chance to read more. I love trees and forks and knives in the road. Cool word play. But I suppose barren wastelands have their charm, too. As do you, Uncle. Hope it’s okay that I added you to my blogroll. I am honored. Thank you very much! Hope you are having a good Friday, too! Hmmm, I love desolate terrain…..God is meditated. The color of your site, the wordplay in you welcoming poem, the humor and the truth – it all left me with a smile on my face. Thank you, Bryan! Nice to meet you. I do believe I’ve seen you around a bit. Soon as I get some time I’ll and come and visit. There is a great joy in whittling for a sailor. Yes, Paul. Dead wood is the hillbilly’s delight. Whittler is the editor who always thinks he’s right. Be careful not to cut yourself, Ms. Mist. It’s about time that someone did that, Ed. My, what keen eyes you have, Gypsy! It’s a good thing my soul is hidden deep. that only come out at night. I loved your tree sketch/paintings. Ditto what Bryan said. He always seems to take the thoughts that are in my head and put them into the words I couldn’t find. Look forward to reading more of your work. And thanks for reading mine! I will keep a knotted eye on you, too, wise lady. How is your brother doing these days? The moonglow is lovely tonight! Hello there, Kate & Ed! He is recovering well, with no complications at this time. His ’98 Mustang is receiving the extra attention it deserves. I would say, he’s enjoying his time off from work. Thank you for your concern, my friends! Thanks for your comments. Appreciate it. The existential font? Simple, combination of things. I’m glad you came on out to find me, Pablo. Happy am I to know you liked a few, jaeson. Thank you! You have some of the finest photos I’ve seen to date. I hope you don’t mind me carving it in among the initials of those wonderful people who have come before me. While I was resting here I was inspired to revisit the form. Thank you. I don’t mind at all, Brad. I thank you, and I bless your rain! I’m not ashamed to say, I’ve never heard of a Ghazal. Welcome to the best rest in the Midwest, iii D! I’m glad you like this idea, Princess. Thank you! I love your poetry Tree and I’ll be back to that knife in the fork in the road. Captivating – poetry of distinction. That’s very nice of you to notice. Thanks for leaping into my woods! You seem to understand many things others don’t even glimpse. What brought you to this state of awareness? Comparitive religion? Yes, I love that too. But wasn’t it that itchy unsettlement deep down that *has* to ask, why? Thanks for making blogging more interactive and communal. they will all drive you crazy until you do something about it. Regrets are like scratch tickets. and they will reveal their truth. you’ll be sorry. Falseness is all wet. That’s a neat facility, Uncle Tree! Great that you are making a name for yourself! Quite thought evoking. I haven’t been around for a while and suddenly Uncle Tree is everywhere. Thought I’d see what all the hollarin’ was about. A wonderful and relevant place you have here. I plan to stop in often. but there’s plenty of whisperin’ goin’ on too, believe you me. Uncle Tree is everywhere? Suddenly? Say, what? My, oh my! TREE IS DOING IT AGAIN!!!! How kind of you to share your sweetest nectar with me! It’s likely to be the only Valentine I’ll see. 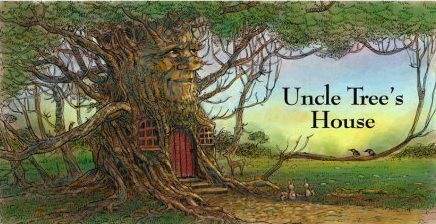 Thank you for joining me in The House of Uncle Tree! Really, Butterfly, that was really very wonderful! seeking the peace and warmth they radiate. Thanks, Uncle Tree, I feel renewed. You’ll always be welcome here. but he understands the why — knot. Have a happy Summer Solstice Monday! everything except for my wallet, that is. Hi, UT! I went to high school with you, and found your website from some FB photos. One of the I read poems before I got to this page was eerily similar to the homily I heard in church this Advent Sunday. I like what I’ve already read, and certainly will read more! I didn’t expect you to know who I was as we did not know each other well back in the day. Judging by your poetry, seems we have a bit in common now. I’ll send you a private message on Facebook; we have a few mutual friends! what it would be a symbol of. Yes, that’s right. Mother Tree. Thank you for the welcome.. I am glad that I stopped by..
You definitely have a very unique way of weaving it across the uncle tree.. or may I say you are the Uncle weaving it for the Tree..
Oh, thank you, my dear Olivia! 🙂 Triple set hearts! I can feel them beating and bleating their love through my bark. Feels so good…ah, where was I? Oh, that’s right. Playing the sap I be. I felt as if I were the sweet bodacious bodhi tree of yore. Your Highness, I was blessed! And I’m still trembling. Just kiddin…wouldn’t even try to carve you…to many knots! great poem though! Let me know if you get any more done on your story …poke! poke! I know ain’t gonna happen cause you ain’t got the time or stomach for it right now. Its good that you have that kinda coolness going on Keith just lettin’ ya know I haven’t given up on you and your writing Take care! to start with, but eventually I did have a few visitors stop by. it came to rest beside my once upon a time glorious crown. I’ve been romancing the stone of my youth ever since. Without rocks being ground down, how could a tree anchor? Thought I’d stop by and top off my need for sound poetry. This was an exceptional piece. May 2012 bring you everything your heart desires! Why, Thank-you! Dear Watson! I do believe, what my heart desires. I am sure and very positive ….I won’t drive off. It’s a new road not yet traveled and in this New Year, no deviations. Well…you go, girl! 🙂 And may God bless your journey! A big THANK YOU! to all who visited me in 2011. I am reminded of the Tree Of Life and the sacrifice He made to get us to the other side. Blessings and happy heartprints to you! Thank you for the totally sweet compliment! From bark to heart, I wish you many blessings! The forest breathes magic, and sighs tranquility. Thank you, Susan! 🙂 And you’re welcome! Congratulations, Keith. Always stay humble and kind. Thank you, Cheryl! 🙂 Best wishes to you.